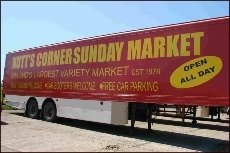 The site has been produced to provide you with information on Nutt’s Corner Sunday Market. It will be updated on a regular basis so look out for different events and services. If you wish to suggest anything regarding the market please contact us. With plenty of bargains available, the most famous variety market in Ireland is definitely worth a visit. I visit the market twice a month, parking is easy, its great and you never know what you will find in the stalls. This market has everything from food to household items, I love the variety and the scale of the place is brilliant! I enjoy setting up the stall here at Nutt's Corner. Its straight forward and there is loads of room. The location pulls a large crowd of customers and the craic is great! Situated on a former airfield, only 12 miles from Belfast, Nutt’s Corner Sunday Market commenced trading in 1976 and has run on its current site from 1995. The range of products and services offered makes it a wonderful place to shop, browse and eat whilst also taking advantage of the expertise of the independent traders. Trading 52 weeks a year this popular weekly event continues to appeal to all the community who value a wide variety of quality goods at sensible prices and friendly personal service. • Market pitches available from £20 per week - £60 per month.